entertainment.ie is allegedly ‘The most popular entertainment website in Ireland’, with 168,000 Irish visitors per month generating 2.5m page impressions. By Irish web standards that’s a considerable amount of traffic. There are some great improvements there. Clean design, and so many engagements points. I for one think it’s quite cool. Even the noise of dynamic imagery and flash is not so distracting a to ruin the user experience. Certainly a step in the right direction. 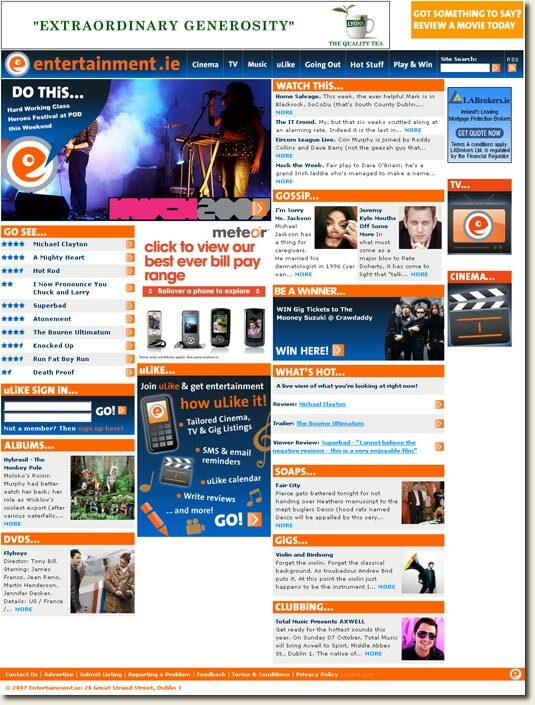 This is G o o g l e’s cache of http://entertainment.ie/ as retrieved on 22 Sep 2007 06:54:44 GMT. Why is Google not updating it’s cache since then? Normally news sites will have there homepage cache updated daily. Not so apparently for entertainment.ie. It appears that whoever was managing the migration forgot about what happens when you change your site structure without considering your users and the search engines. All the old paths appear to land you on a plum 404 page. I give it about 5-7 days before search engine traffic all but disappears for entertainment.ie – October wont be seeing 2.5m page impressions methinks. And nor will November if this is handled correctly. I wonder how much traffic to the site is SE referrals? All I know is whatever the intent there it wont work. That particular implementation is very misguided. Well done on the new design though. You should subscribe to the RSS Feed here for updates. Yea the new design looks great, the must have got a injection of cash with all the offline advertising they are doing right now. The event list link seams to just be a badly structured sitemap, so why they didn’t just do it right and avoid any gray areas I don’t know. There is very little point in redesigning something if you can’t implement the design properly. Have they completely changed their URL structure? Seems bizarre. And didn’t they just introduce a sitemap rather than the crap at eventlist.htm ? I haven’t seen any on TV either but they are running ads on the sides of buses and possibley billboards (Can’t remember) here in Dublin. I have to say that I’m not too fond of the new site either. There’s a discussion over on CI about it too [link below]. The home page is too busy. Looking at it I remember the presentation by Eoghan McCabe at Bar Camp in Dublin where he showed an example of how the eye moves around a page and distracts the user. My eyes seem to hopping all over the page and not focusing on anything in particular. What happened to the rule of thirds? I’ll still use the site as the content is good but I think more could have been done with the content layout and styling. Surprised they haven’t handled legacy pages correctly. I have to do that for a redesign I’m launching next week. It’s not that difficult to implement. I have to say that I really like the new design and layout of this one. The flash ads on the old version always seemed a little out of place but with the new design they integrate much better. All in all I think the layout seems to fit nicely together and the navigation is pretty good. I would say that Events link could be a blackhat (or at least greyhat) seo technique. That sitemap has lots of juicy keywords in those links. “Saturdays at Gorbys”? When the Sunday Times revamped their website they broke all their old URLs. Bloody annoying as I had linked to several articles in the archives. Funny – I think this is an improvement over their previous site. @Chris – glad to see someone else agrees with me. The guys over at creativeireland were none too positive. @Donncha – very unlikely to have any positive effects on rankings… whoever came up with that tactic really doesn’t know what they’re at. The new layout is much pretty good than the old one. The new design is good but need to change the colors used on it, it distracts the user’s eyes. But I like the simple flash ads that enhanced the user online experience. Yeah I agree, the Events link could be a blackhat seo technique which is not good. Your analysis does not seem to match with what I’m seeing. I checked Google’s cache within 12 hours of the new site launch and found the new homepage had already been indexed. Since then a more comprehensive crawl has been done and all new pages seem to be there. As for the structure the vast majority of the URLs have remained exactly the same and I have not seen any 404s – but if any are found please post them! All the cinema listings pages, TV station listings, reviews etc have the same URLs as before. Events have had theirs improved to include categories and venues but since the events are only on the site for a few weeks they are not as important as the other URLs (and the old URL structure has been coded to redirect to the new structure). The site #1 for “cinema ireland” and #2 for “TV Ireland” (after RTE) so the rankings seem to be doing OK. Thanks for dropping by. I can assure you that the old site category links were dropping me on 404 pages when I wrote this. It is quite normal for your homepage to be refreshed in the cache most frequently. In fact if your homepage hadn’t been udated quickly in the cache I’d be worried. I don’t have any of your old URLs from the previous cache to test any longer – sorry. But I am quite sure that the page URLs did change. Did you previously use file extensions (.asp/.htm)? There were no redirects on the few pages that I tested (perhaps your developers read my blog ). Michele – Nope, not a thing. Seems to work for me? also 301′s over to www. Golden Spiders - Are These Really Ireland's Best Websites? 13 Deadly Google Sins - Is Your Website Committing Any of These? © 2004-2019 Red Cardinal Ltd. Registered Address: 7 Rectory Meadows, Edenderry, County Offaly.